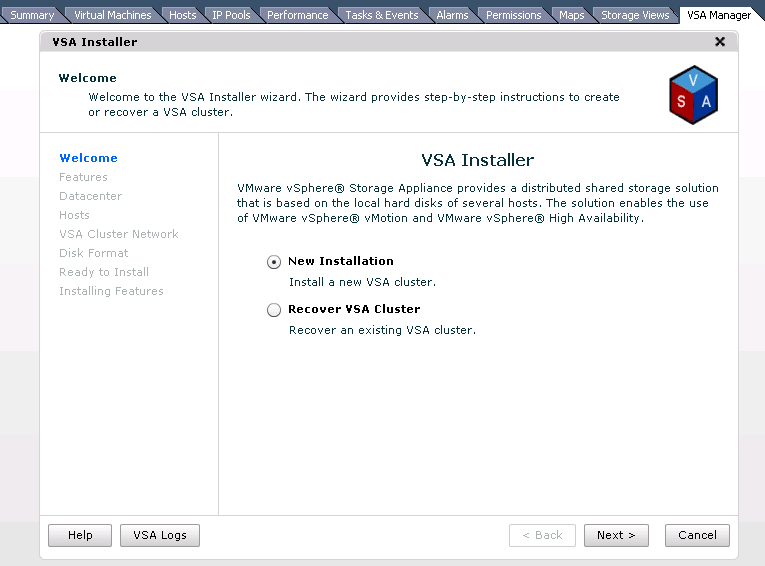 Now it’s time to install the VSA. Remember, we need 2 (or 3) fresh ESXi 5.0 installs, joined to our vCenter server. 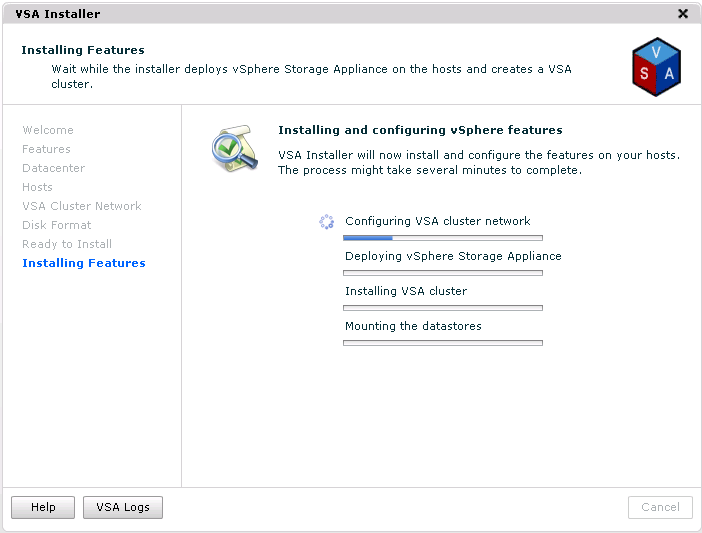 Run the VSA setup from the CD on your vSphere server. Click next and “I accept” through the first screen and agreements. 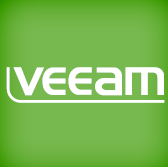 Enter in your name or IP address of your vCenter server. Enter your License key (or blank for trial). Next to install, and then Finish! 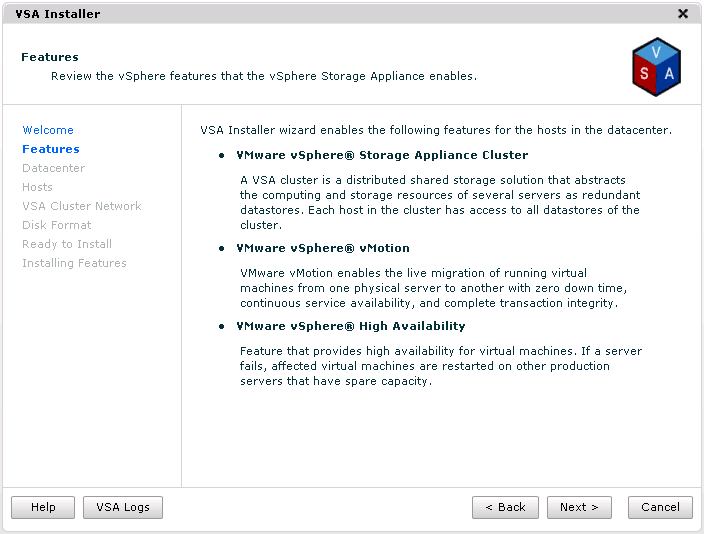 Next, in our client, we need to open plugins and make sure the VSA manager plugin is installed, and enabled. 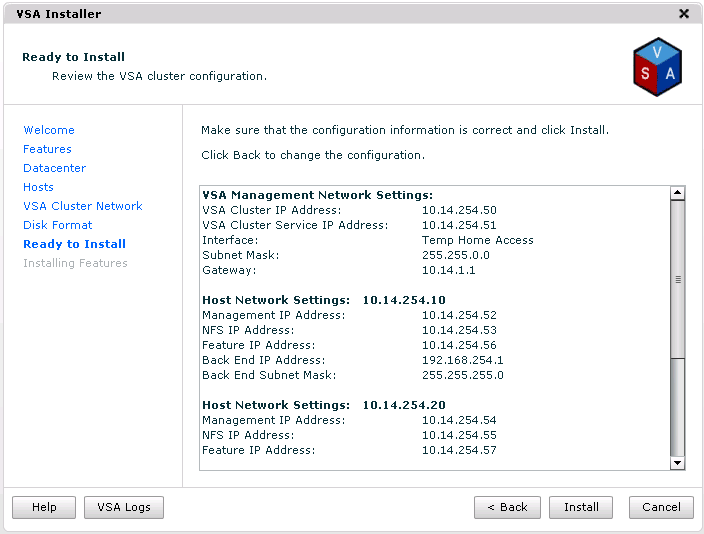 Notice the “Recover VSA Cluster” – this is there to restore the VSA information back into vCenter if you happened to reinstall vcenter from scratch, or replace it without migration. 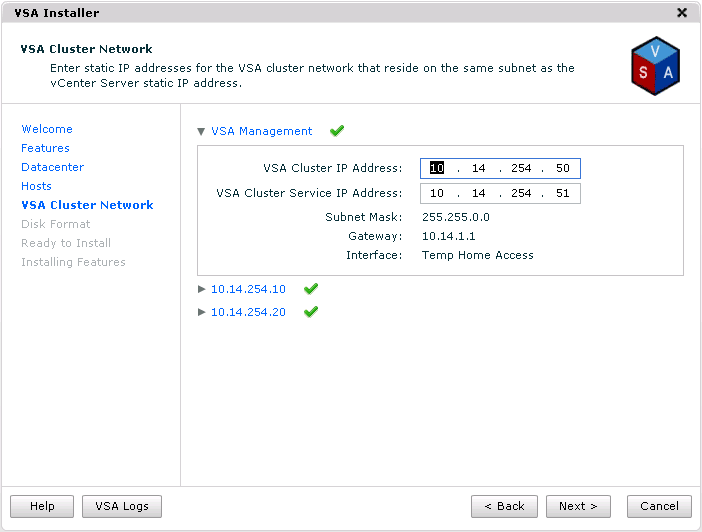 It scan your ESXi servers for VSAs, and import the cluster. Now, we want to choose New Installation, and Next. 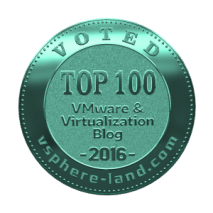 Notice how nice VMware is… They are going to setup our Cluster for us, and enable vMotion and HA with the recommended settings. Select the Datacenter your fresh ESXi servers are in, and verify the host count. 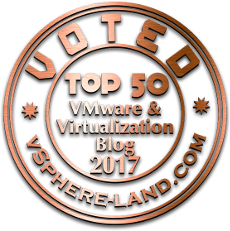 Here is where you select your ESXi servers you want used to host a VSA VM. The details link will show you any information regarding problems with the host that won’t allow setup to continue (like less than 4 NICs). 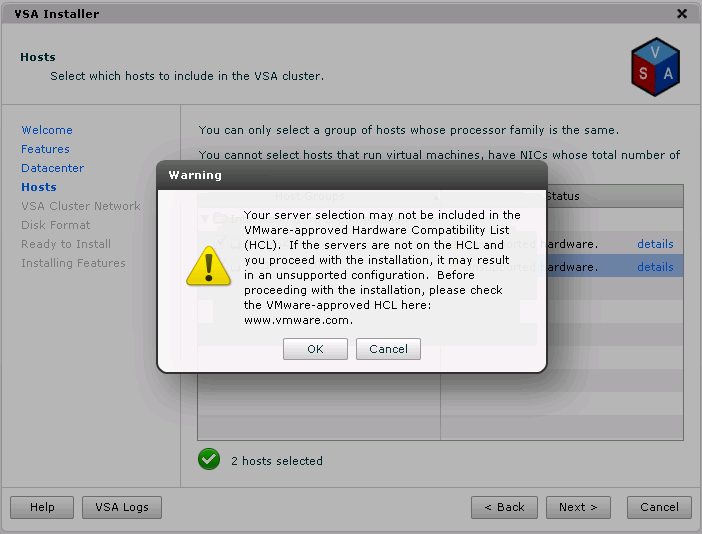 As noted in the screenshots above and below, my hardware is not on VMware’s HCL. However, I am allowed to continue on. Now we are prompted for IP information. VMware was also nice in this portion of the setup, and once the first IP is entered, it will automatically fill in sequential IPs in the following fields. Next, the IP information for each Host, which is also automatically entered for us. 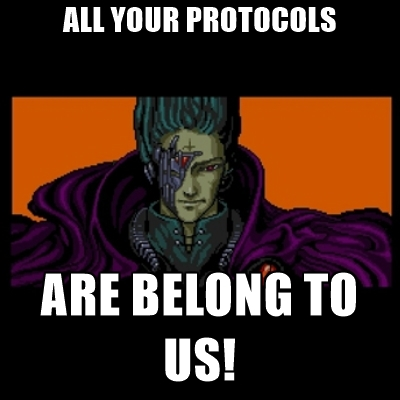 DHCP is selected by default for the Feature IP addresses for each host, however, I decided to use statics. You also have the option to tag them to a specific VLAN if you want to separate your traffic. 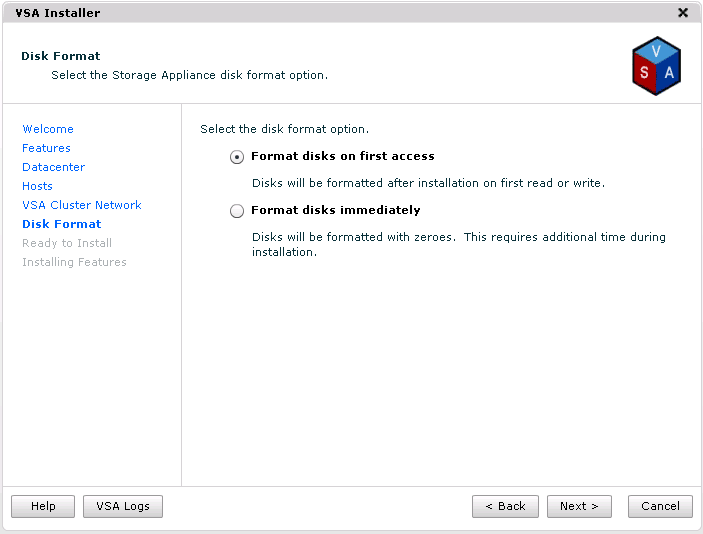 Next, the installer asks when we want our storage formatted. If you have the time, I recommend formatting immediately. This will prevent the overhead later on when we are using the disks for the first time… However, depending on hardware, you probably won’t notice a difference. A nice summary of our chosen settings. And finally, a warning that it’s going to erase everything on local storage. Progress… This took about 10 minutes, maybe a little less. At this point, we have 2 ESXi servers, now in a Cluster with vMotion and HA enabled. Each host already has LUNs presented to it from each VSA via NFS, and is ready for production use. 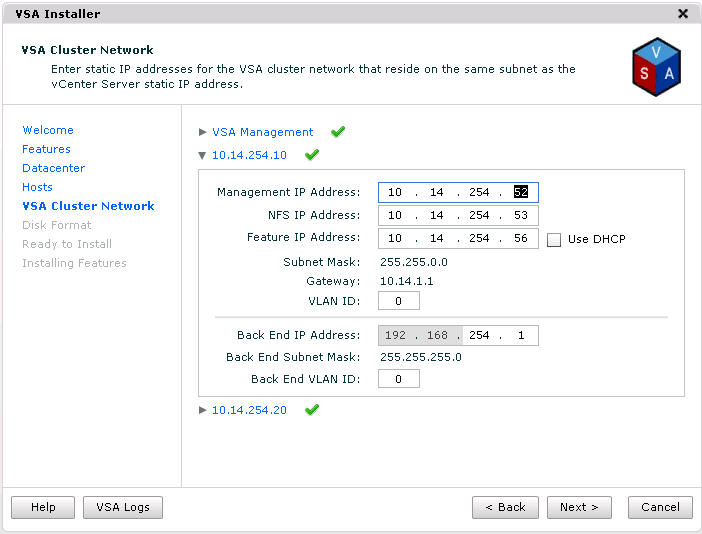 can we install VSA with two NICs? does it support with two NICs only? 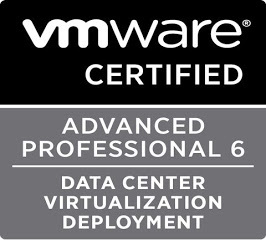 I have just upgraded to ESXi 5.1 essentials plus and woudl like to deploy the VSA. 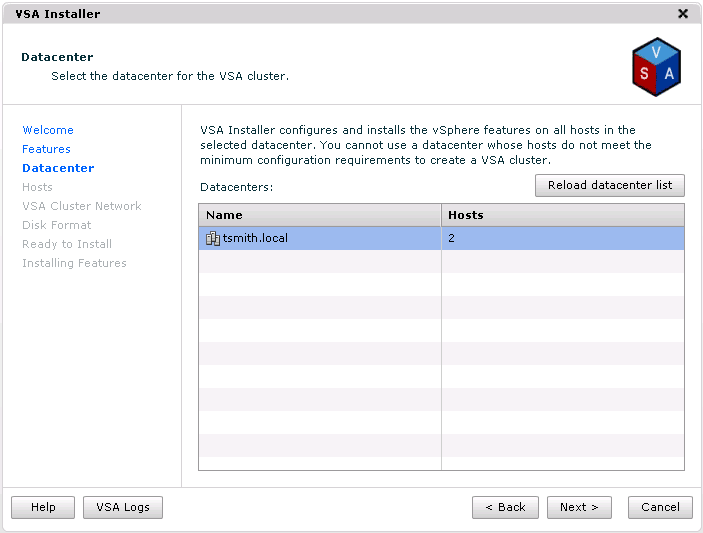 Your guide has been great but I have 3 local datastores, 1 for ESXi, 2, Contains running VM’s, 3 blank for the VSA. However when I go through the install wizard I get an error stating only 1 datastore is supported. Have you any advise? Q. My ESXi has more than one datastore. Can I specify the datastore that VSA should use? 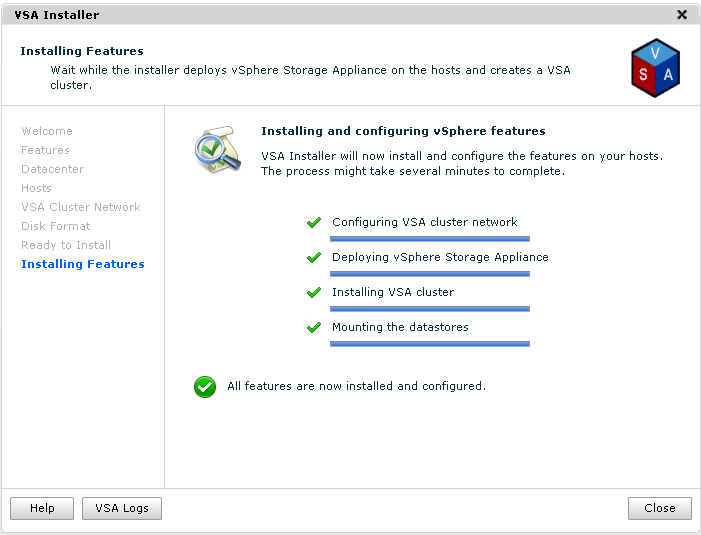 A. VSA 1.0 expects only a single datastore on the ESXi server, and you cannot select a different datastore.